The leading independent specialist for windscreen replacement and windscreen repair based in Hastings and serving all of the Hastings area. National Windscreens Hastings fitting centre provides windscreen replacement and windscreen repair services to businesses and individuals throughout Hastings and the Hastings area. 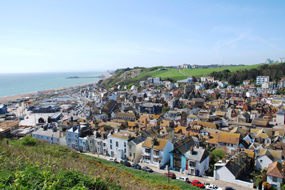 The small seaside town of Hastings has been part of Hastings and East Sussex since the 19th Century. Travel to the nearby town of St. Leonards can be achieved by using the A21 north. Hastings boasts many beautiful parks for example Warrior Square Gardens, St. Leonards Gardens, Gensing Gardens and Markwick Gardens. These all provide a relaxing and pleasant environment to socialise with family and friends in. The Hastings windscreen fitting centre and its mobile vehicle glass technicians service the needs of Hastings and the surrounding area including Eastbourne, Hastings, Bexhill-on-Sea and Battle. With 108 fitting centres and over 800 mobile technicians, National Windscreens operates the UK's largest windscreen repair and windscreen replacement network. The company provides low cost, high quality windscreen replacement and windscreen repair from its Hastings fitting centre 24 hours a day, 7 days a week, 365 days a year. Repair and replacement of all types of vehicle glass including windscreens, rear windows and side windows is undertaken throughout Hastings and all of the Hastings area.